Smaller diameters such as 3mm, 3/16”, 6mm, 10mm, 12mm, 16mm & 20mm are Bright Drawn. Intermediate sized Stainless Steel Round Bars with diameters such as 25mm, 30mm, 35mm, 40mm, 50mm, 2.1/4”, 2.1/2” & 3” will usually be Smooth Turned, although some sizes are Bright Ground. Diameters from 3.1/4” and up to 7” dia will normally be Rough Turned. These Stainless Steel Rods are generally stocked in 3 metre long lengths and we cut them down to the size as requested by the buyer. We offer each individual size of Grade 303 & Grade 304 Stainless Steel Bar in a whole host of handy lengths, starting from as little as 15mm long! We then offer you a free cut so that if you need a length of 50mm Dia 304 Stainless Rod that is 585mm Long, you only pay for the nearest length offered (In this case it would be 600mm) and we will cut it back to 585mm at no extra cost – saving you money on what would otherwise be wasted material. Stainless Steel Round Bars have many great attributes. They are hard, strong, and have excellent anti-corrosive properties. In many cases, Grades 303 & 304 are interchangeable, however there are slight differences in each of the grades composition which make either of them the obvious choice for certain applications. 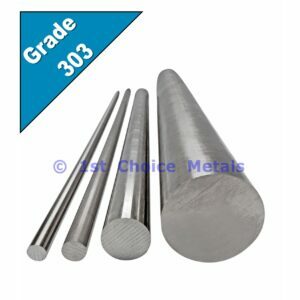 Grade 303 is the Free Machining grade of Stainless Steel, making it the perfect choice when the bar either needs to be heavily machined, or when large quantities of items are being machined. Examples of this are machined or turned components for mass produced items such as cars, motor bikes, tools and machines. This excellent machineability is achieved by the addition of a small amount of Sulphur into the composition of the steel. The down side of this is that Grade 303 contains slightly less Chromium and Nickel when compared to Grade 304, giving it a lower resistance to corrosion and a slight reduction in its toughness. The Grade 303 Stainless Steel Round Bar is not recommended for Welding – although welding is possible with the correct equipment & working conditions.